Our specialty is cooked-to-order, perfectly seasoned, dry-rubbed wings. Unlike the average wing joint where wings are fried, placed in a warming cabinet, then re-fried when an order is placed, BKW wings are cooked-to-order with only the freshest ingredients. Our wings are prepared using a higher frying temperature which quickens the cook time and lessens the grease resulting in a delicious, crunchy texture on the outside while remaining tender and moist on the inside; a truly better tasting, dry-rubbed wing. There is no other restaurant that focuses exclusively on the dry-rubbed wing experience like we do. Our wings are a deliberate departure from the traditional wing fare: they are not breaded; they are not tossed in sauce; and, they are never frozen. Our award-winning wings are made cooked-to-order and seasoned with our gourmet seasoning blends designed to enhance the flavor of the meat rather than to mask it in a peppery sauce. Our BKW Seasonings and gourmet blends bring out the true flavor in almost any food and are featured throughout our menu. At BKW our sauce is never tied to the wings. With over twenty sauces to choose from, our homemade sauces are served on the side for less mess and so our customers can share in our creativity. We encourage experimentation! Our wings are made to be a meal, not just an appetizer. 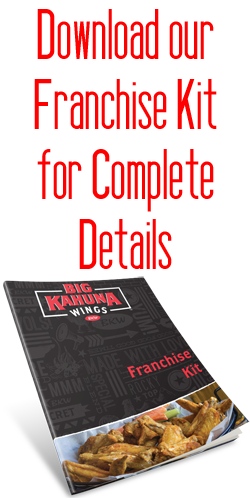 We ensure only the biggest and highest quality wings are served at Big Kahuna Wings. At BKW, you can order traditional, boneless, or our signature Big Kahuna Wings, the whole wing finally together again. The size and juicy meatiness of the wings, especially the Big Kahuna Wing, beat any other wings feathers-down. We believe food is all about the preparation. Our gourmet seasonings have been satisfying taste buds for over 40 years. From our Kahuna Pig Fries, Gourmet Burgers, and Jalapeno Chicken Wrap, you will experience the most unique seasonings to ever hit the market.